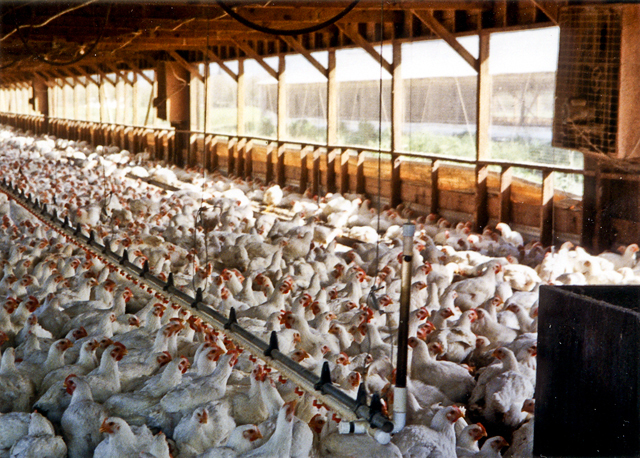 Although not confined in cages like egg laying chickens, chickens raised for meat are packed so tightly in grower houses that each chicken is alloted about half a square foot of space. If that isn't bad enough, because broiler chickens have been bred to grow so quickly (twice as fast and large as their ancestors) the organs and skeleton don't always keep up with this growth. The heart and lungs can't support the unnatural body mass, resulting in heart failure and large numbers of deaths a year due to health conditions.